The Jawzer Bone is a 4” natural USA white bare bone filled with cheese and bacon flavored goodies. These extremely popular bones will keep small to medium size dogs busy for hours, digging for the awesome treat buried inside. 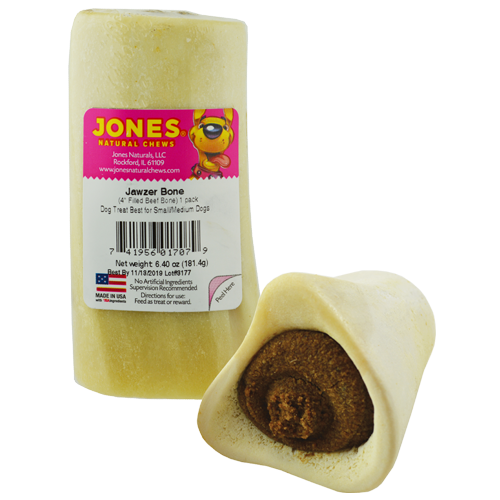 All Jones’ products are 100% grown and made in the USA. beef bone, chicken, cane sugar, molasses, water, vegetable glycerin, rye flour, rice flour, citric acid, buffered white distilled vinegar, vegetable oil, mixed tocopherols (preservative), lecithin, rosemary extract.